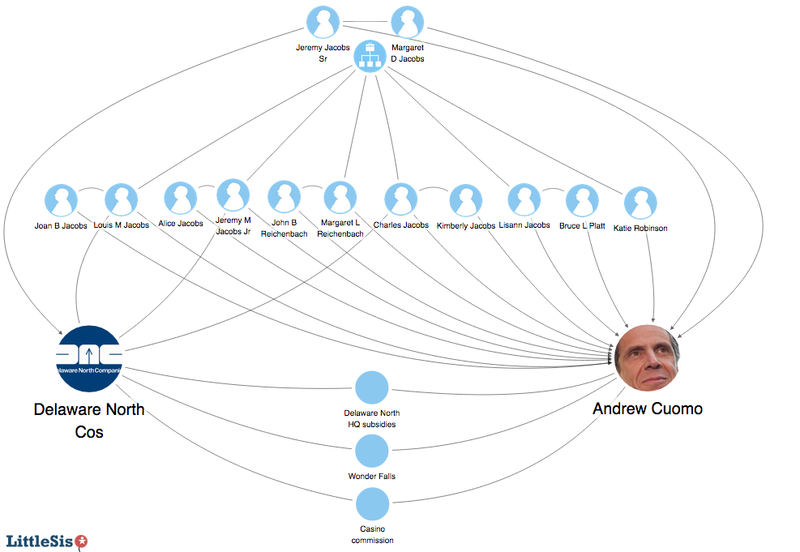 The Jacobs family tree converges with the Cuomo re-election campaign. Governor Andrew Cuomo’s recent campaign finance filings provide a useful guide to one of Buffalo’s more prominent family trees, that of the Jacobs family, owners of the multi-billion dollar concessions conglomerate Delaware North. In the three months prior to his election, the governor received a series of $5,000+ contributions not only from Jeremy Sr. and his wife Margaret, but also from every one of their six children (Jeremy Jr., Lisann, Louis, Charles, Margaret Reichenbach, and Katie Robinson), plus five of their children’s spouses (Alice, Bruce Platt, Joan, Kimberly, and John Reichenbach). No politician had ever received contributions from all 13 contributors, though Jeremy’s nephew, Erie County Clerk Chris Jacobs, came close in 2010. Some of the checks were likely handed over at a September fundraiser that Jeremy and Margaret hosted for Cuomo at their East Aurora estate. Other leading members of Buffalo’s power elite paid $2,500-$25,000 to attend the event. In October, Cuomo reported a $5,000 in-kind travel contribution from a Delaware North-related company, Management Services, Inc. We suspect that Cuomo is familiar with its Gulfstream G200 corporate jet. All told, Cuomo received $74,750 from the Jacobs family this year. Attempting to establish a clear link between a particular campaign contribution and a related payoff is always a perilous exercise, fraught with uncertainty. Perhaps the Jacobs family’s generosity towards Cuomo had something to do with the controversy that arose last year when Delaware North sought millions in public subsidies to move its headquarters a few blocks. At the time, Cuomo rose to the Jacobs family’s defense, placing a call to Jeremy Sr. that was reported on the front page of the Buffalo News. The subsidies were eventually approved. There was also New York State’s approval of another project by Delaware North and Uniland, the $150 million redevelopment of Niagara Falls’ Rainbow Centre mall into a hotel and entertainment complex called “Wonder Falls.” That project, which will receive subsidies as part of Cuomo’s Buffalo Billion, was announced in August, just one month before the Jacobs fundraiser. Or perhaps the payoff is related to Delaware North’s gaming business in New York State. Cuomo’s casino commission is in the process of approving four new casino licenses. One of those proposed casinos is located near Delaware North’s Finger Lakes Gaming and Racetrack, and so could pose a threat to its bottom line if it gains approval. Notably, the gaming interests of Delaware North’s predecessor, Emprise (founded by Jeremy’s father, Louis), led to a 1972 conviction of the company on federal racketeering charges for concealing an ownership stake, alongside mob interests, in a Las Vegas casino. In 2010, the Jacobs family did not bother to bundle smaller contributions to Cuomo—Jeremy and Margaret just cut him twin $50,000 checks. Since then, the governor has been hit with a federal inquiry into his efforts to thwart the Moreland Commission, which was supposed to investigate questions of pay-for-play politics in New York State. In this environment, the optics of accepting upper-limit contributions from the Jacobs family while being so attentive to their business interests are not particularly good. Then again, the family tree method hardly puts questions of a quid pro quo to rest. But really, the family’s universal support for Cuomo probably has less to do with one tidy payoff, or even with the several possibilities listed above, than with Cuomo’s overall record as a public servant. This is a governor that can rise above the fray (perhaps with the help of a Gulfstream jet), overcome democracy, and get things done for the billionaire class. And that’s the sort of leadership that a Jacobs can believe in. LittleSis.org (the opposite of “Big Brother”) tracks information on power networks in Buffalo and throughout the United States. Have a Buffalo power tip for us? Email tips@littlesis.org.